The U.S. Department of Transportation’s release of the NPRM for Operations Over People last month highlights the significance of NUAIR’s recently completed ASTM parachute recovery system (PRS) standard test campaign. NUAIR was proud to partner with Indemnis, the manufacturer of a UAS PRS that could be used during flights over people, to successfully complete the required test flights at the NY UAS Test Site using a DJI Inspire 2 drone. 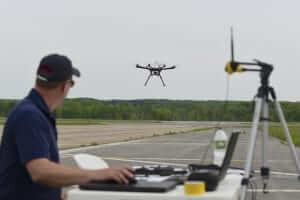 The recently released NPRM proposes rules to allow flights over people without a waiver – so long as the unmanned aircraft is compliant with the proposed rule and meets the rule’s prescribed safety level. This safety level refers to the limitation of injury caused by transfers of kinetic energy, exposed rotating parts, or safety defects. Essentially, the applicant must gain FAA acceptance of their means of compliance by submitting a detailed description of the means of compliance; and justification that they meet the required safety level. The NPRM specifically states that means of compliance may include consensus standards. So, a consensus standard for a PRS limiting the kinetic energy of the drone by slowing it down under the parachute could be used as a means of compliance. Written by many UAS industry stakeholders, but primarily by the major PRS manufacturers and with significant FAA input over the course of almost two years, the specification covers the design and manufacture requirements for deployable parachutes of small unmanned aircraft (sUA). This specification, F3322-18, defines the design, fabrication, and test requirements of installable, deployable PRS that are designed to be integrated into a sUA to lessen the impact energy of the system should the sUA fail to sustain normal stable safe flight. But that’s not all that’s needed. In determining the overall level of risk for flights over people, the totality of the circumstances should be considered, as opposed to a kinetic-energy only based risk analysis. An Operational Risk Assessment (ORA) such as ASTM F3178 − 16. 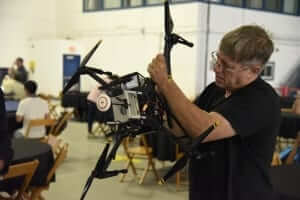 An ORA offers to a proponent, pilot, manufacturer, or regulator of UAS a standardized approach to examine their operations for potential hazards and assess related risk. The ORA is then used to mitigate or avoid risks associated with those hazards to achieve acceptable levels of safety. The ORA is a key component of any Operational Risk Management (ORM) process, which seeks to identify hazards endemic to an operation, assign risks to those hazards based on quantitative and qualitative analysis, and mitigate unacceptable levels of risk. The Standard, however, is not the silver bullet some of the recent articles I have seen seem to indicate. The kinetic energy limits in the NPRM are just so low that few UAS of any commercial merit at all will be able to meet Cat 2/3 “out of the box”, even with a perfect PRS. This puts the onus squarely back on the FAA to approve waivers based on an ORA using relevant data from analysis and testing. For NUAIR, this validates our efforts to build our third-party performance verification capability – NUSTAR. Using compliance with industry consensus standards in the waiver process will help the FAA keep up with the large number of waivers that will be requested. We expect in the near future to see applicants for operations outside the so-called “Part 107 bubble”, like Operations Over People, who need to obtain verification that they have mitigated their operational hazards by demonstrating compliance with a consensus standards for PRS, impact energy, electronic registration, ID and tracking, and more.